The SNP and Plaid Cymru are refusing to rule out legal action over plans for three election debates between the main UK party leaders. The BBC and Sky have promised to hold separate debates between the parties in Scotland, Wales and Northern Ireland. But the SNP and Plaid Cymru called their exclusion from the main UK-wide debates "undemocratic". The UK Independence Party want to be included in parts of the debates. The Greens also want to be included. 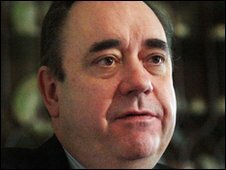 SNP leader Alex Salmond says he will fight it in the courts if necessary. Plaid leader Ieuan Wyn Jones said his party was also taking legal advice, arguing that it deserved to be part of a UK-wide debate because there could be a hung Parliament in which the nationalist parties would have role in deciding the next government. He rejected the broadcasters' argument that the debate should be restricted to party leaders who could be the next prime minister. He told BBC Radio 4's The World at One: "I don't think anybody, including Nick Clegg, thinks that the Lib Dems are likely to form the next government." The first of the 90 minute programmes, with Labour Prime Minister Gordon Brown, Conservative leader David Cameron and Lib Dem leader Nick Clegg will be on ITV, the second on Sky and the third on the BBC. It is understood Sky News will hold debates in Scotland and Wales. The SNP have pointed out that the courts prevented the BBC from broadcasting an interview with the then prime minister John Major during Scottish local elections in the 1990s, and Alex Salmond has made it clear that legal action could be on the cards again this time. Mr Salmond said he would be seeking "guarantees of inclusion from the broadcasters, given their inescapable duty to ensure fairness and impartiality in election-related coverage in Scotland". He added: "It is entirely unacceptable to Scotland as well as to the SNP for the broadcasters to exclude the party that forms the government of Scotland - and indeed is now leading in Westminster election polls." Parties hoping to gain their first seat at Westminster are also unhappy with the format of the debates. The UK Independence Party, which won more votes than Labour and the Lib Dems in the European elections, say they want to be included in segments of the debates covering the EU, direct democracy, immigration and the economy. "Our presence would provide a real voice of opposition and make the debates far more entertaining." A Green Party spokesman said: "Why on earth shouldn't [Green Party leader] Caroline Lucas be part of it, when she has obviously got so much to say and when a significant portion of the electorate support what she has to say?" He added: "We are taking this as seriously as you might expect us to. "We believe that with our proven track record of support and our distinctive agenda we should be part of any such debate." 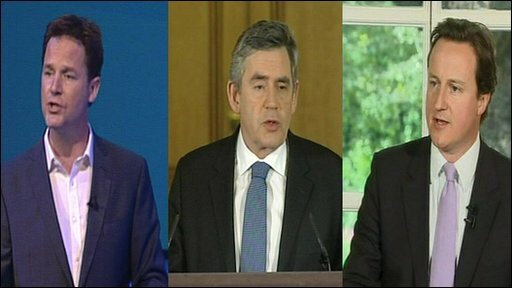 The leaders of the three main parties at Westminster have each welcomed the chance to take part in what will be a first for a general election in Britain. The prime minister told the Daily Mirror: "I relish the opportunity provided by these debates to discuss the big choices the country faces.